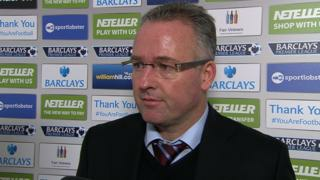 Aston Villa boss Paul Lambert describes his side's 1-0 win at Crystal Palace as a "massive result" after it ends their nine-match winless league run. Christian Benteke's first goal since March was enough to seal all three points and give Villa only their eighth goal of the season. Villa have scored in three successive matches for the first time since April.